We’re here in Italy where the newest addition to Sony’s RX100 line of compact cameras was just unveiled: The Sony RX100 VI brings quite a few new features to the popular line while preserving its compact size. 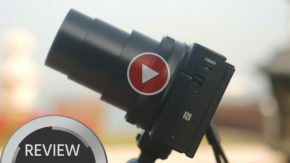 It is HDR (HLG) compatible, has a very fast AF and a new ultra-zoom lens. Sony Also announced the new Grip to acompany the RX100 series (and RX0) cameras. Sony RX100 line of cameras has been considered as one of the best options in compact cameras segment in the past years in terms of image quality. Now Sony announced and presented the new generation – the Sony RX100 VI (the exact model name – DSC-RX100M6). What is new compared to the older generation? Let’s take a look. First time for the RX100 series, Sony incorporated an ultra-zoom lens in the camera’s tiny body – the ZEISS Vario-Sonnar T* 24-200mm (full frame equivalent) with the aperture of F2.8 – F4.5, which is a little bit slower than its predecessor’s lens (which was F1.8 – F2.8, but “only” had a range equivalent of 24-70mm). The compactness of this lens is achieved thanks to its design featuring two ED (extra-low dispersion) aspherical glass elements and eight aspherical lens elements including four AA (advanced aspherical) lenses. Additionally, the lens has built-in optical “SteadyShot” image stabilisation that is equivalent to a 4.0-stop faster shutter speed (CIPA standard, pitch/yaw directions, at “long end” – 200mm). 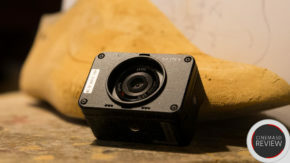 Sony also claims that their new RX100 VI sports the world’s fastest (along with the Sony RX10 IV and among fixed lens digital cameras with 1.0-type sensor) Hybrid AF system with 315-point focal-plane phase-detection that cover approximately 65% of the sensor and contrast-detection AF. With this AF technology the camera can acquire focus in 0,03 seconds (CIPA standard, internal measurement, at f=9.0mm “wide-end”, EV6.9, Program Auto, Focus mode: AF-A, Focus area: Centre). Also first for the RX100 series of cameras, the Sony RX100 VI includes Sony’s High-density Tracking AF technology. It concentrates AF points around a subject to improve tracking and focus accuracy. The Eye AF technology is available as well with approximately 2x the tracking performance when compared to the RX100 V. Furthermore, the camera has LCD touch focusing and touchpad focus point control for users that would like to drag their fingers to focus points of their choice. The new Sony RX100 VI is equipped with a 20.1 MP 1.0-type (1″ size) stacked Exmor RS CMOS image sensor with DRAM chip and an upgraded BIONZ X image processing system with a front-end LSI. The camera has a high speed Anti-Distortion Shutter (maximum shutter speed of up to 1/32000 second) that reduces the rolling shutter. It can shoot completely silently in all modes when electronic shutter is engaged (mechanical shutter mode is available as well). It can shoot at up to 24 fps at full resolution with continuous AF/AE tracking. The buffer limit is 233 images (with “Continuous shooting mode: Hi” and “Image quality: Fine”). When shooting 4K video (UHD 3840×2160) the camera shoots with full pixel readout and no pixel binning to preserve good details and minimize moire. The camera can also record in S-Log3/S-Gamut3 picture profile. In Full HD mode it shoots at up to 120fps. Proxy recording is another nice video feature in the new Sony RX100 VI. Super slow motion video is available at either 250 fps, 500 fps or 1000 fps in PAL mode. It is possible to switch between PAL and NTSC modes. The super slow motion modes are recorded without sound and Class 10 or higher SDHC/SDXC memory card is required. For the first time in a Cyber-shot camera, the Sony RX100 VI features 4K HDR compatibility thanks to its new HLG (Hybrid Log-Gamma) picture profile that offers an instant HDR workflow solution. In order to view HDR (HLG) movies, the camera needs to be connected to an HDR (HLG) compatible Sony TV via a USB cable. The new Sony RX100 VI is equipped with a high-contrast 2.35 million dot XGA OLED Tru-Finder EVF with ZEISS T* Coating. The EVF itself retracts in and out of the camera body based on user preference, and can be activated instantly by a single One-push Access button. 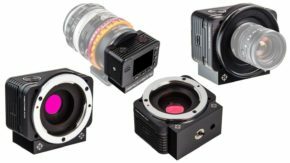 The display lag of the EVF has been reduced compared to prior models. Also, continuously shot images can now be played back in group on display instead of individually – making it more convenient to review the footage. First in the RX100 series, the Sony RX100 VI has a touch shutter that can be activated by tapping the back LCD screen, a zoom lever with customisable zoom speeds and an LCD that can be rotated 180 degrees upward or 90 degrees downward. There is also a Monitor Auto OFF function that saves battery and therefore increases max number of still images by up to 30%. Camera’s wireless connectivity options include Wi-Fi, NFC and Bluetooth. Another new announcement is the VCT-SGR1 – a versatile and compact new Shooting Grip for Sony’s RX0 and RX100 series of cameras (Compatible with DSC-RX0/RX100M2/RX100M3/RX100M4/RX100M5/RX100M6/HX90V/HX90/HX80/HX60V/HX60 /HX50V/HX50/WX500). It is a vertically-oriented shooting grip that attaches to Sony’s RX0 and RX100 series of cameras via Multi/Micro USB Terminal. 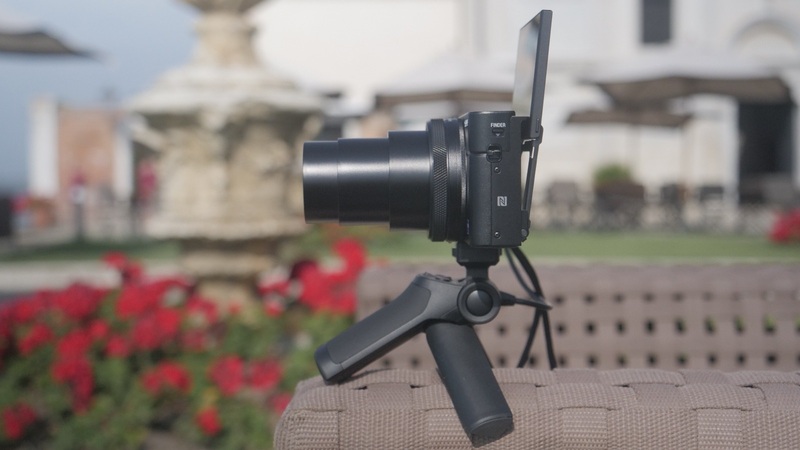 It is compact and lightweight, and can adjust angles up to 70 degrees or down to 100 degrees to capture different perspectives including high-angle shots, low-angle shots and self-portraits. The grip features several buttons at the top of the grip including shutter release, REC stop/start and zoom functionality. Zoom control function is not available for models without zoom (Firmware update of Clear Image Zoom for RX0 is scheduled in Autumn, 2018). Additionally, the bottom of the grip can be spread-out and used as a tripod. The new Sony RX100 VI compact camera will ship in July 2018 priced approximately at $1,200,- USD (£1,150). The new VCT-SGR1 Shooting Grip will also ship in July 2018 priced at approximately $100,- USD. 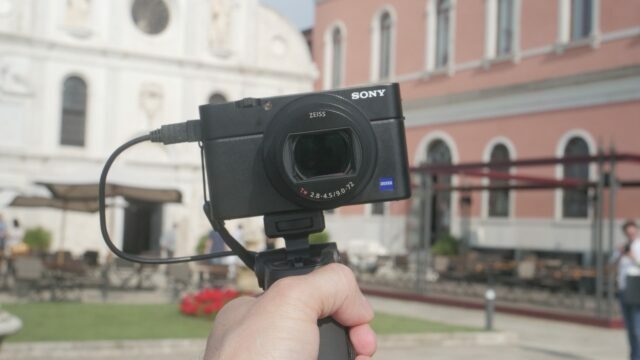 Expect some footage from this camera soon as our very own Johnnie Behiri is in Italy at the Sony Press Event for the unveiling of the RX100 VI, where he will give it a spin shooting with it overnight. Are you in the market for a compact new go-anywhere camera? Have the new features of the RX100 VI convinced you? Let us know in the comments below. Any word on overheating issue? I did not really shoot long sequences with it so I can’t really tell.